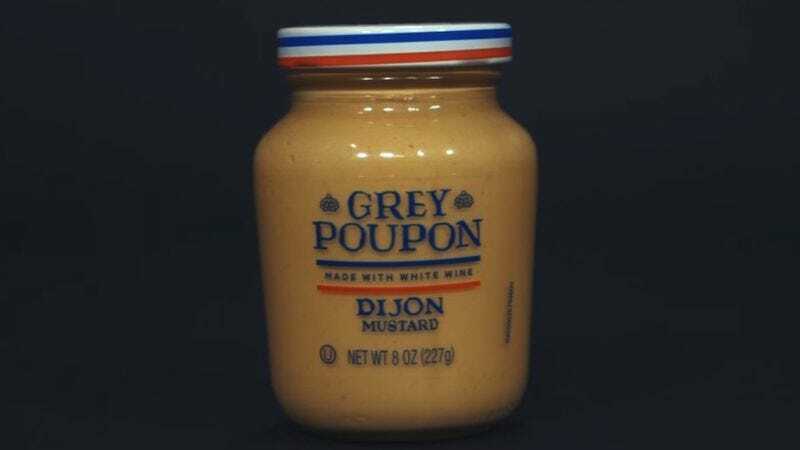 Whether because it’s a familiar status symbol or simply because it rhymes so well with “coupon” and “futon,” Grey Poupon has been the most popular mustard in hip-hop for decades now. Kanye West raps about it. So does Jay Z. Grey Poupon is practically a motif on Ghostface Killah’s 1996 album Ironman. Vox’s Estelle Caswell hadn’t planned on researching the history of condiments mentioned in rap lyrics, but she couldn’t ignore all those references that kept popping up in the music she loves. So she dug around a little, and what she found was rather remarkable. Grey Poupon references are not only extremely common in rap, verging on cliché, but they’ve all but exploded in the last few years. Caswell’s 10-minute video traces the history of the “overpriced white wine Dijon mustard” over the last few decades and explains why this particular condiment has made such an impact in popular culture. Created in France, Grey Poupon has been around since 1866 and has been on sale in America since 1946, but domestic sales didn’t really spike until 1981, when a ubiquitous television campaign promoted the mustard as an affordable luxury. “Pardon me. Would you have any Grey Poupon?” became a pop culture catchphrase, even surfacing in Wayne’s World. In 1992, Das EFX included what is “probably the first Grey Poupon reference in hip-hop history” on “East Coast,” a track from its platinum album Dead Serious. From then on, the mustard became “a symbol of class” in rap music. The recent boom in Poupon references, though, seems to have been kicked off by “We Fly High” by Jim Jones and a slew of other chart-topping releases. For those who want to delve further into the topic, Vox features an interactive Grey Poupon timeline and playlist.